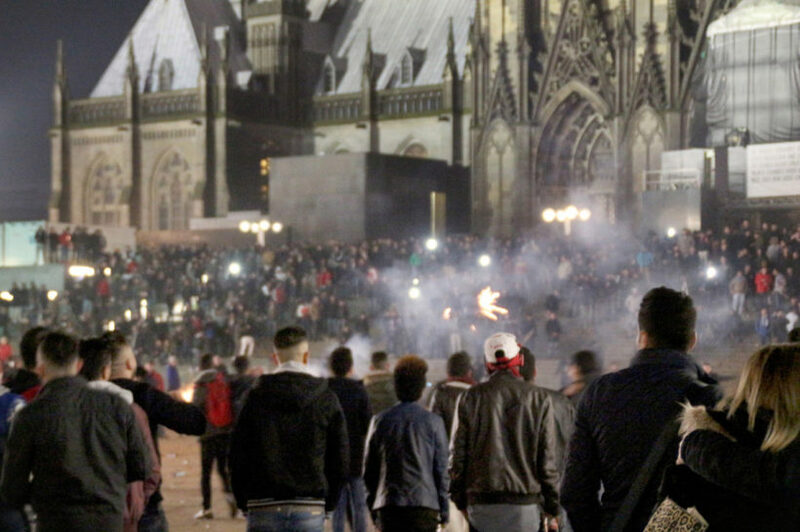 Attacks on women in Cologne and other German cities on New Year’s Eve have prompted more than 600 criminal complaints, with police suspicion resting on asylum seekers, putting pressure on Chancellor Angela Merkel and her open door migrant policy. The sudden nature of the violent attacks and the fact that they stretched from Hamburg to Frankfurt prompted Germany’s justice minister Heiko Maas to speculate in a newspaper that they had been planned or coordinated. 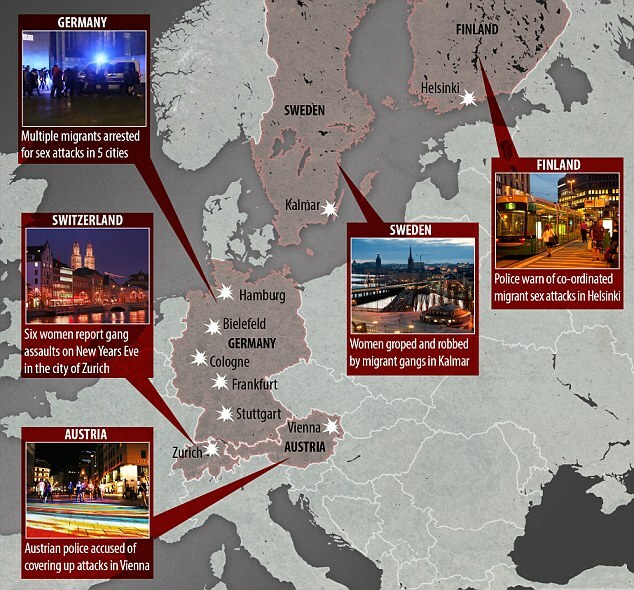 Map of migrant attacks on women on New Year’s Eve. The debate on migration will be further fueled by the acknowledgement by the authorities in North Rhine-Westphalia that a man shot dead as he tried to enter a Paris police station last week was an asylum seeker with seven identities who lived in Germany. In Cologne, police said on Sunday that 516 criminal complaints had been filed by individuals or groups in relation to assaults on New Year’s Eve, while police in Hamburg said 133 similar charges had been lodged with the north German city. Frankfurt also registered multiple complaints as well. In Cologne, where a 100-strong force of officers continued their investigations, around 40 percent of the complaints included sexual offenses, including two rapes. The attacks, which prompted protests by German citizens on Saturday, threatens to further erode confidence in Merkel, and could stoke support for the anti-immigrant Alternative for Germany (AfD) party ahead of three key state elections in March. Merkel’s popularity has dwindled as she refused to place a limit on the influx of refugees from Syria and other Muslim countries. The Cologne attacks also heated up the debate on immigration in neighboring Austria. “What happened in Cologne is unbelievable and unacceptable,” Austrian Interior Minister Johanna Mikl-Leitner. There had been a handful of similar incidents in the border city of Salzburg, Austria. “Such offenders should be deported,” she said, backing a similar suggestion by Merkel. SAO PAOLO – Brazilian riot police on Friday fired tear gas and stun grenades to disperse a violent protest against a rise in public transport fares in the country’s largest city, Sao Paulo. Television images showed small groups of rock-throwing, masked youths clashing with police in the center of the metropolis, amid burning piles of rubbish. Protesters smashed the windows of buses and vandalized bank agencies. Many Sao Paulo residents have been angered by the increase in public transport prices, with inflation in Brazil already running at more than 10 percent. More than 1.5 million Brazilians lost their jobs in the year to November, as Latin America’s largest economy edged deeper into its worst recession in more than 25 years. The march gathered thousands in Sao Paulo’s downtown area and quickly turned violent when masked youths threw rocks at police. There was no immediate information about arrests or injuries. 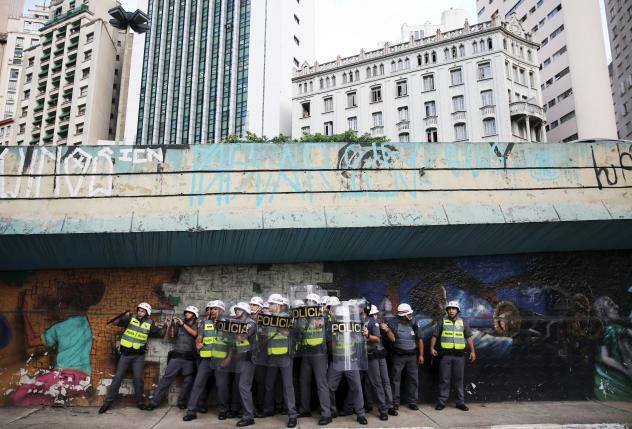 Police also clashed with protesters in the city of Rio de Janeiro later on Friday. Television images showed masked protestors spray painting buses and smashing their windows. The scenes evoked protests that swept Brazil in 2013, sparked by anger over bus fare increases, that brought hundreds of thousands of people onto the streets. 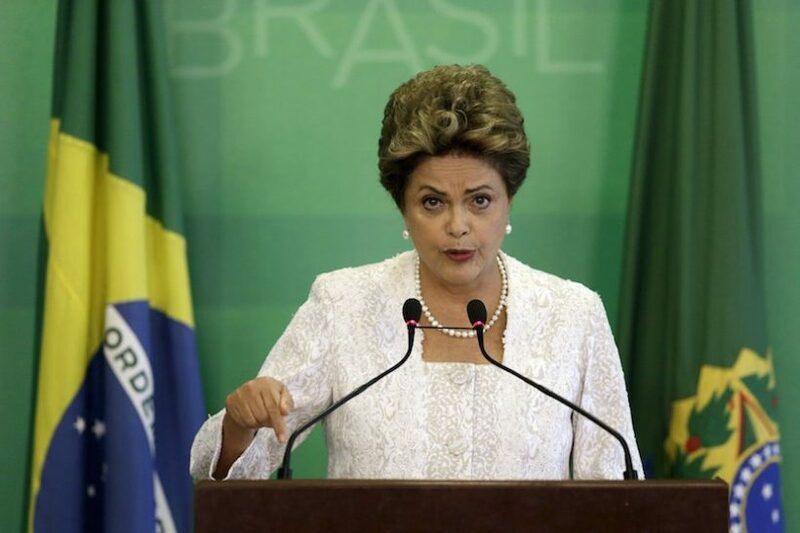 The demonstrations come as left-leaning President Dilma Rousseff, whose popularity has been crushed by the recession and a sweeping anti-corruption investigation that has ensnared her ruling coalition, faces impeachment proceedings in Congress. Some political analysts say the mood on the streets toward her government could play an important role in determining the outcome of the impeachment process. The new majority in Venezuela’s parliament wasted no time showing who’s now in control, using its first week in power to remove all images of the late Hugo Chávez from the National Assembly building. National Assembly employees removed pictures of the late President Hugo Chavez from the legislative building in Caracas on Wednesday. 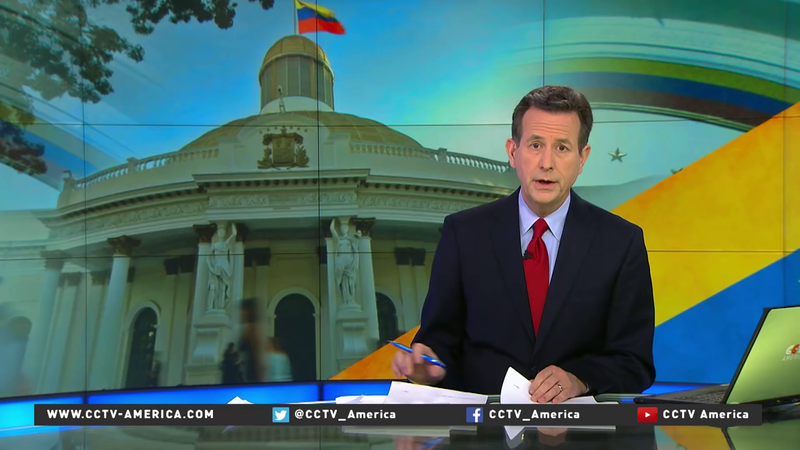 Venezuela’s opposition has broken the government’s long grip on the legislature. 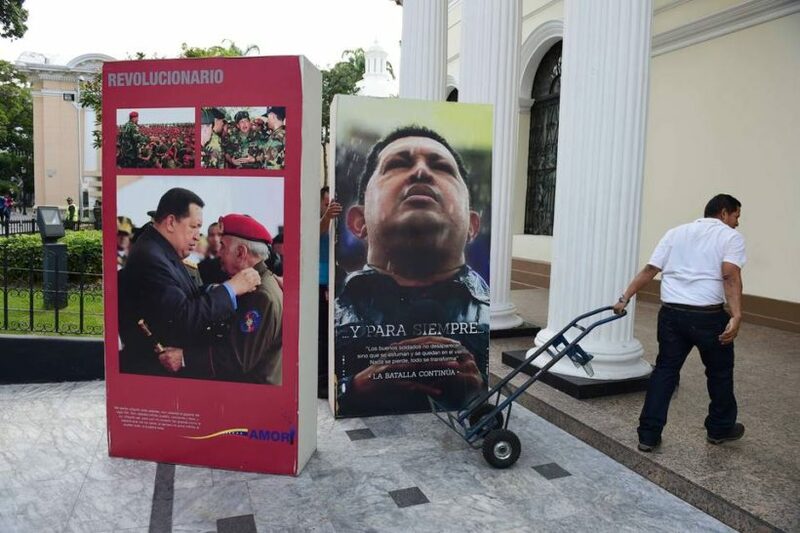 Images of the two men were erected throughout Venezuela during more than a decade of Chávez’s rule, their portraits looking down on people from government buildings, billboards and signs. On Wednesday, a day after the new parliament was sworn into office, videos show Ramos instructing workers to take down all those pictures that hang in the capital complex. 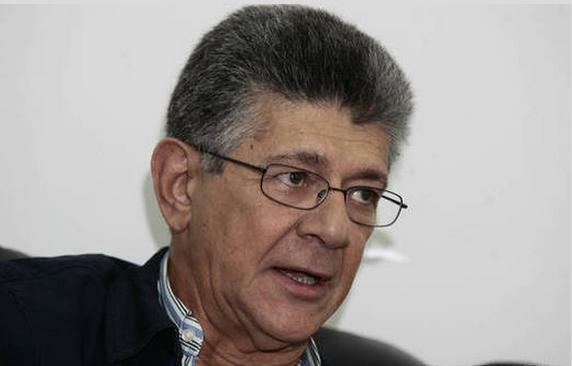 Ramos’ decision to remove images of the former leaders became the latest insult in a difficult transition to the new political reality in Venezuela. c) Read the “Background” below the questions. Does the fact that it is most likely a small percentage of the almost 1 million migrants and refugees from Muslim countries affect your view of when and how many refugees should be welcomed to the U.S.? Explain your answer. b) Why were Brazilians protesting? c) Who is blamed for the violence during the protests? d) How do you think law enforcement from any country should deal with this type of violent protestor? e) How does violence affect the legitimacy of their protests? b) The opposition party (opposed to socialist President Nicholas Maduro) won the majority in the National Assembly in the December election with 74% voter turnout. Watch the video under “Resources.” Why did they remove multiple photos of longtime leader Hugo Chavez from the National Assembly building? In addition to attacks in Germany, Austria and Switzerland, asylum seekers who met in central Helsinki, Finland to celebrate New Years’s Eve “had similar plans” to commit sexual assault and other crimes as those who targeted women in the Germany city of Cologne, Finnish Police have reported. Three Iraqi asylum seekers have been arrested for committing sexual assaults during the celebrations in Helsinki’s Senate Square, where some 20,000 had gathered. Finland’s security personnel reported “widespead sexual harrassment” during the celebrations, police added, with women complaining that asylum seekers had groped [them] and kissed them without permission. He said that police had established a “very massive presence” to control the estimated 1,000 Iraqi asylum seekers who had gathered in the tunnels surrounding the central railway station by 11pm, many of whom appeared to be under the influence of alcohol or drugs. Sao Paulo’s demonstration began peacefully but turned violent when masked anarchists started throwing rocks at police. The Sao Paulo State Public Safety Department said 17 people were arrested among 3,000 protesters and three police officers were injured. Protesters also smashed store and bank windows and set fire to at least three buses, it said. Police in Rio de Janeiro said one masked protester was arrested after incidents similar to those in Sao Paulo, but on a smaller scale. Organizers of the Rio demonstration, which came just months before the city hosts the 2016 Olympic Games, said about 2,000 people took part. Police didn’t offer any estimate. The protests were mobilized after Sao Paulo Mayor Fernando Haddad raised bus fares from 3.50 reals to 3.80 reals, then his Rio colleague, Eduardo Paes, raised that city’s fare from 3.40 to 3.80 reals. The new fare is just under a dollar, but the increase comes with Brazil’s economy in recession and as people struggle with prices that already rose more than 10 percent last year. Most protesters were peaceful, and many criticized the violence by anarchists who often participate in demonstrations. They often break windows at banks and multinational companies and also clash with police. Friday’s demonstrations were reminiscent of those in June 2013, which started to protest increased public transportation fares but mushroomed into nationwide demonstrations against government corruption at all levels, poor public services and the billions being spent by Brazil to host the 2014 World Cup and the 2016 Olympics. December 2015’s parliamentary election is the first major defeat of the socialist party in Venezuela in 17 years, and since it represented a turnout of almost 74% of the eligible population, can be said to be unquestionably representative. There are chronic shortages everywhere. In a country with supposedly the largest oil reserves in the world, people queue around the block for goods that most likely won’t be there to buy when they get to the front. They can’t get medicine, or parts to fix their cars. Inflation runs at anything from 200% to 600%, depending on who you believe, and the currency – at least officially, if not always in practice – has lost four fifths of its value this year alone. Violence has plagued the run-up to the poll. And socialist President Nicolas Maduro’s response – that it was “not the opposition who triumphed, but circumstantially a counter-revolution has triumphed” – amplifies the sense of somebody who has lost the ability to decipher the national mood. President Maduro continues the same harmful policies, which has led to the unpopularity of his socialist party and their loss of Assembly majority in the recent elections.